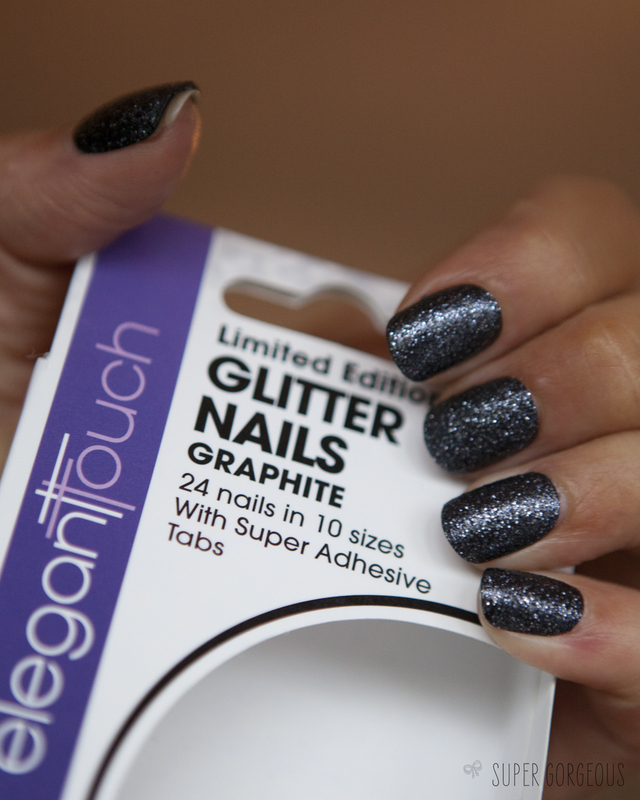 Elegant Touch recently launched a range of limited edition stick-on false nails in three shades, pink, red, and graphite. 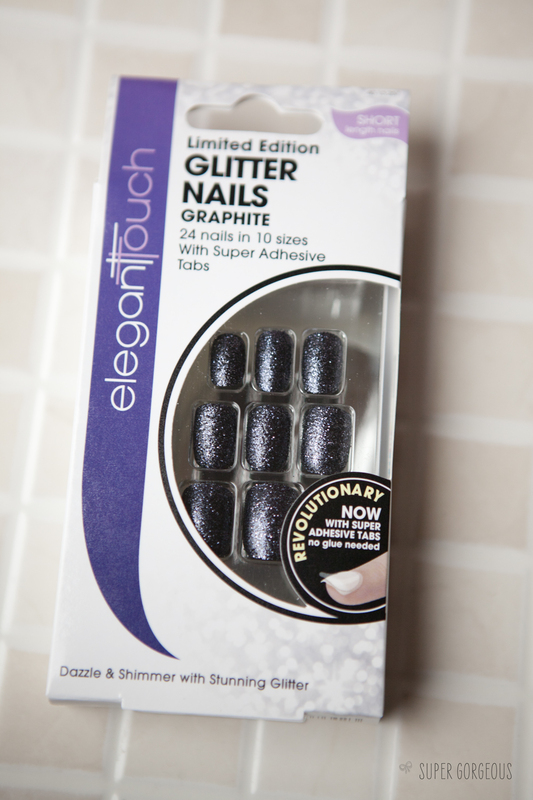 I wanted something hassle-free and sparkly to wear at Christmas, so I tested out the Graphite. There are 24 nails in the pack, which come in varying sizes to fit your nails (or if you happen to lose one! ), self adhesive sticky tabs, and a nail file. 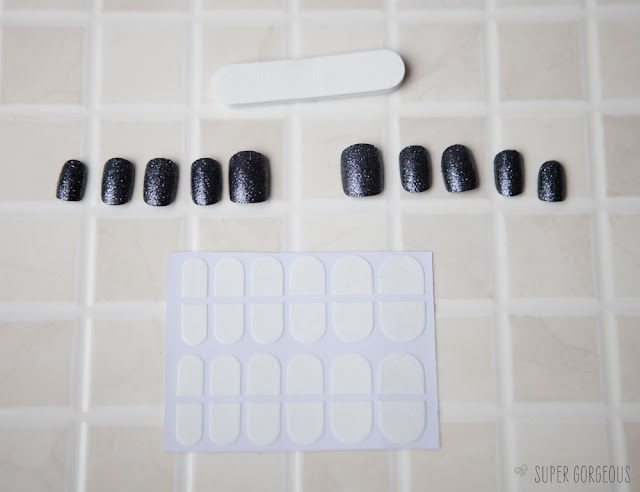 There is no reason why you couldn't use nail glue with these if you wanted them to last a little longer, but as I wanted something temporary and non-damaging to my nails, I used the adhesive tabs included. They are very easy to apply - just a case of finding the right nail to suit each finger, applying the tab then the nail on top. I had a little difficulty matching the nails up, as the combination of me having very long nail beds, and these nails being short, I ended up having to chop all my nails off so these would fit. My own nails are also quite narrow, so I ended up using a lot of the smaller nails from the pack. The thumb nail (as you'll see from the photo below) wasn't quite right, but it was the best fit from the pack. They are very sparkly, in a matt kind of without being glossy - I really like the effect they give. Here's another photo from Christmas day where you can see what they look like in a natural situation. Removing them the next day was really easy - just a case of gently lifting them off - my nails showed no sign of damage. I would definitely use these again for a night out, I'm just not sure I could cope with them for a long amount of time as I was conscious one was going to pop off! I love the effect of these nails, I can just never get away with falsies myself. However, I've never tried Elegant Touch so the next time I have a special occasion I might give them a whirl. 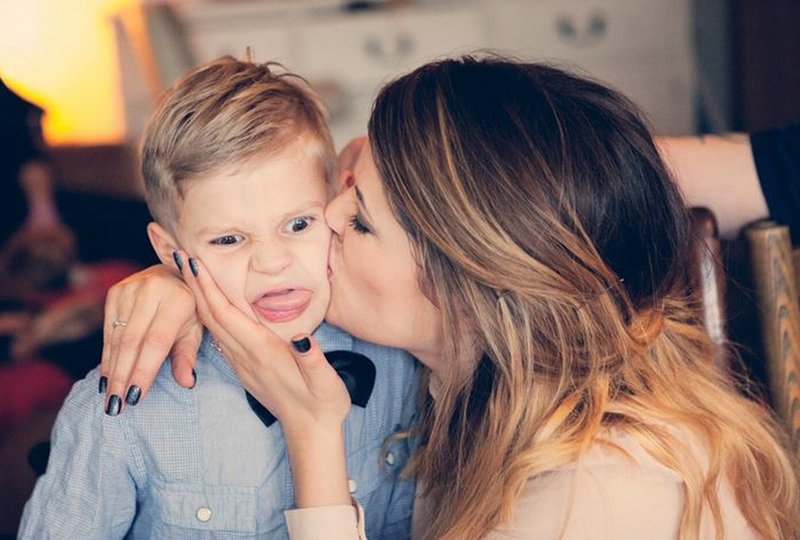 I totally love the colour of your hair! Where have you had it done?